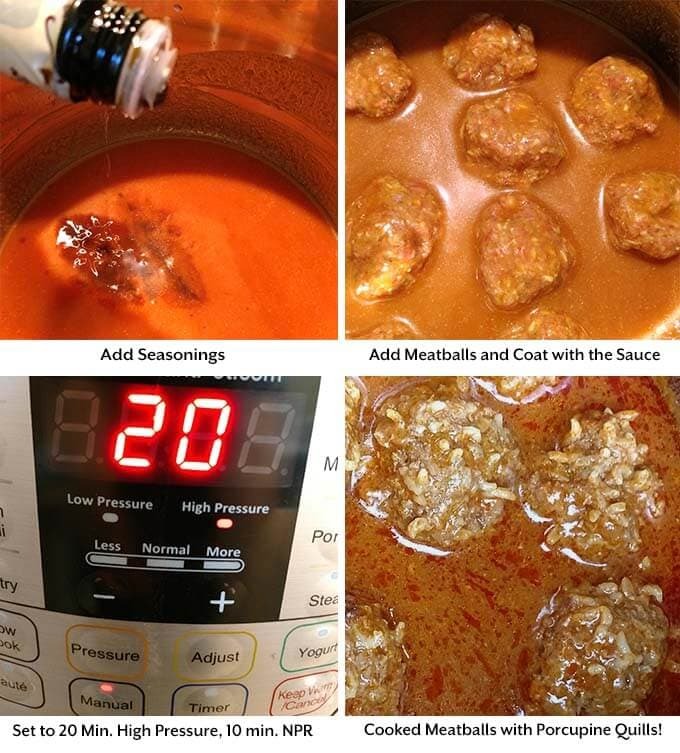 Instant Pot Porcupine Meatballs are a tasty and simple recipe, made with ground beef, rice, and a simple tomato sauce. Easy to Cook in your electric pressure cooker! I’m still going through Nana’s recipes and picking out the ones I want to convert to pressure cooker recipes. Nana had many already for the pressure cooker, such as the wildly popular Instant Pot Beef Barley Vegetable Soup. That recipe really struck a chord with a lot of people. My theory is because it is simple, homey, healthy, and just a touch old fashioned. You don’t see a lot of modern recipes like that. It’s also delicious and easy to make! 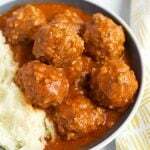 Porcupine Meatballs are also a little old fashioned, and I loved Nana’s simple recipe. I did adapt it a bit to give the dish a little more flavor, but it is still close to my childhood memories. I made these for Bryen when he was growing up, and he loved them. Kids love Porcupine Meatballs! I know I sure did, and still do! Those little grains of rice poking out of the meatballs are fun to look at! And fun to eat! The sauce is simple and tasty! When they come out of the pressure cooker, the grains of rice are standing up like porcupine quills! 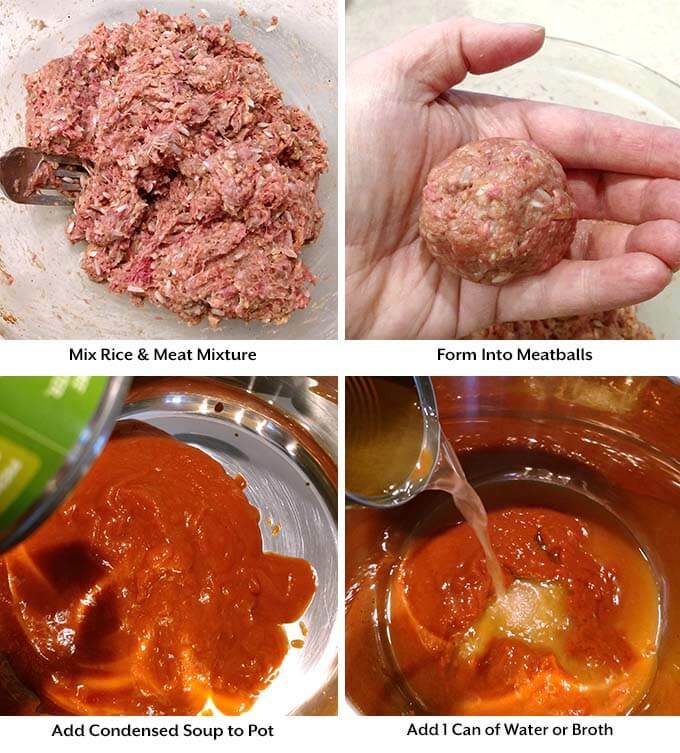 Instant Pot Porcupine Meat Balls are a tasty and simple recipe, made with ground beef, rice, and a simple tomato sauce. Easily cooked in your electric pressure cooker. Mix all of the ingredients for the meatballs together and form into 12 to 14 small meatballs. Set aside. Mix the sauce ingredients together and stir well to combine. Pour into the pot and turn on the Sauté mode to start the sauce warming up. When the sauce is just starting to simmer, stir it and carefully add the meatballs to the pot. Close the lid of the pressure cooker and set the steam release knob to the Sealing position. Cancel the Sauté mode. Press the Manual (or Pressure Cook) button, and then the + or - button to choose 25 minutes. When the cooking cycle ends, let the pot sit and naturally release for 15 minutes. Then manually release the remaining steam until the pin in the lid drops. Open the lid and serve the meatballs with some sauce over them. These Instant Pot Porcupine Meatballs go well with crusty bread, salad, or a vegetable side dish. U said to use stinky ring when using to hard boil eggs to diminish odor. I also added a dash of vinegar. And, to take handles off of 3qt stainer, if you put handles in a vise and rock strainer back.and forth will break cleanly. And not leave unsightly dimples on finished edge. Hi Giz! Thank you for the tips, that will really help others! Great to hear from you! Have a wonderful day! Is the rice just a fun, decorative element? Can I just omit the rice to make standard meatballs? Thanks! I think it was just a fun way to make meat stretch further back in the olden days. I haven’t made this particular recipe without the rice, but if I did, the first thing I would change would be the cook time. I’d drop it down to 15 minutes. That is good to know. I will try that. Thank you, Sandy! 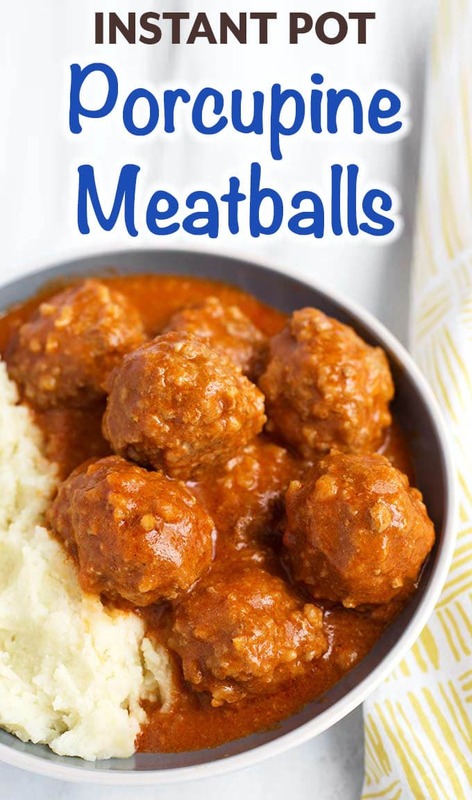 Can you double the recipe of meatballs for using the instant pot? Does the cooking time change? Hi Rhonda, I would not increase the time for this recipe. If you double it, also double the sauce. I remember these meatballs from my youth but we put some into green peppers and pressure cooked for 15 mins on 15 lbs of pressure. How is the instant pot different? Hi Audrey, I have never put them in green peppers, sounds good. In this case, I put them in the sauce and let them cook directly in the pot. The electric pressure cooker cooks at 11 PSI. You don’t need a stove, just enough liquid in the pot to bring it to pressure. Great recipe! I thought I had tomato soup that was condensed but it was Progresso tomato basil so the sauce wasn’t as thick. Hi Carol, still sounds good though! Thanks for your review! Peel and quarter potatoes and cook with meatballs and you have full meal! I wonder if you could tell me how to incorporate chopped cabbage into this recipe. Hi Holly! What I would do is remove the meatballs after cooking. Then add the cabbage to the liquid and turn on the sauté LOW setting. Then cook it for a few minutes until cabbage is the desired tenderness. Then turn off the pot and add the meatballs back in and serve. Thank you, Libby. 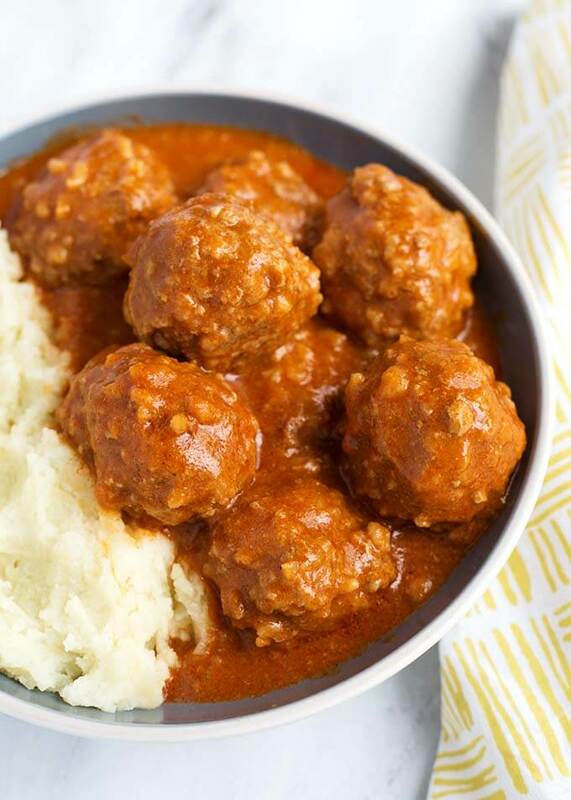 The traditional Porcupine Meatballs are made from ground beef. I agree they would be good with half sausage, however my Granny would say you would have to change the name, lol! Porcospino is Italian for porcupine so ‘Porcospino polpetta’? To mix thoroughly I start with ground meat, adding first 1/4 – 1/2 tsp baking soda (which helps the meat stay moist) gently press flat and even. Cover evenly with each ingredient fold gently before making meatballs. Browning the bread crumbs in equal part butter really makes a better meatball too. Made this for dinner. It was very good thanks for sharing the recipe. We loved this recipe! I added some fresh thyme and rosemary to the meatballs and used tomato sauce and tomato paste in place of the tomato soup. I then served it over zucchini noodles! Even my 4 year old asked for seconds. Thanks for reminding me of this dish from my childhood! I’ve never been fond of tomato soup so I was wondering about using tomato sauce. I’m glad you posted since the tomato paste hadn’t occurred to me and it would be good! WE prefer brown rice. Would there be a time change? Yes, you will need to cook it longer. Be sure to use parboiled brown rice. Would you need to make any changes if you use ground turkey? No, I would keep it as is. Would it be better to use minute rice or brown rice? And time changes? I just do not have any white rice. You can use Minute rice. Great, simple, quick recipe! My family loved it! I added a pinch more salt and some Herbs de Provence to the sauce while it reached a simmer. Adding this to the weekly rotation! Thank you! That’s great, Megan. Herbs de Provence are so underused! What a neat way to use them! Iralea, that sounds very creative and delicious! Good luck! Let me know how it turns out! I love V8! Great adaptation!